While looking for a new audio driver for Vista on RH2 I found this exhaustive post on nForcersHQ.com forum covering various ADI SoundMax drivers for XP and Vista (btw, mine has an ADI 1986 chip, or so it says in Device Manager, Hardware IDs). I've tried the latest one from the ASUS series, the one labeled 6.10.02.6400 [03-01-2008] which I believe is in fact 6.10.1.6400 due to some strange ASUS version labeling, I've seen this with the latest sound driver available on the ASUS R2H drivers page as well - note the driver version on the page then download the file and open the i386\Vista\ADIHdAud.inf and look for DriverBuildID. You may have to uninstall the previous SoundMax drivers from ASUS (Control Panel > Programs and Features). It seems to bring an audio processor from Sonic Forge that you can configure from Control Panel > Sound > Playback (tab) > Speakers (configure) > System effects (tab). You will also notice that when enabling the Sonic Focus processing the sound is fuller and also audiodg.exe will take about 10% CPU. Oh, the software will also install a SoundMax entry in Control Panel that doesn't seem to work and it's related to that the same icon in tray area (disabled, you can get rid of it using Autoruns - also remove the SoundMaxPNP entry if you get an error message about it when you logon). One other thing, when enabling the audio effects, these drivers still have the bug where it's loosing handlers, explained here at WithinWindows.com - you see them going by in Task Manager or Process Explorer, add the Handles column and watch audiodg.exe process - before throwing another one at Microsoft :-) read the article at WithinWindows.com. Same luck with the 6.10.01.6380 Lenovo drivers, installer doesn't work, you could update them manually but again why would you. Finally, the conclusion is that if you want the audio effects you should install the ASUS drivers. 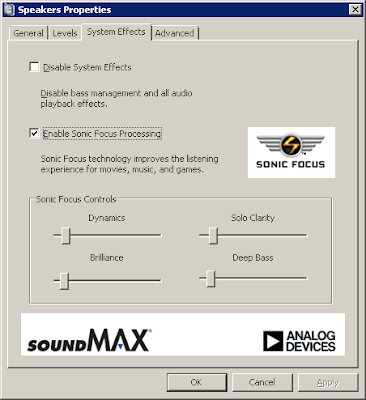 If you don't want/need the effects you can simply uninstall previous SoundMax entries from Control Panel and use the Device Manager to manually update the drivers with whichever driver you want, without the audio effects they all sound as flat as the other one :-) I'll keep an eye on the Sonic Focus support page if they post a driver for ADI 1986 (the current one is for 1988 chip) maybe the CPU usage is going to drop as well as fixing the handles issue.